John Wayne 24K Gold-Plated Quarter and Half Dollar 2-Coin Set | BUDK.com - Knives & Swords At The Lowest Prices! Great for coin collectors, movie fans, etc. There are tough guys, and then there’s “the Duke” - John Wayne, a real man’s man if ever there was such a thing. The old rebel-rousing cowboy is featured on the heads of these beautiful 24K gold-plated coins, a genuine JFK Half Dollar and Iowa Statehood Quarter. He’s pictured in both with his trusty hat atop his head and that iconic grin on his face. 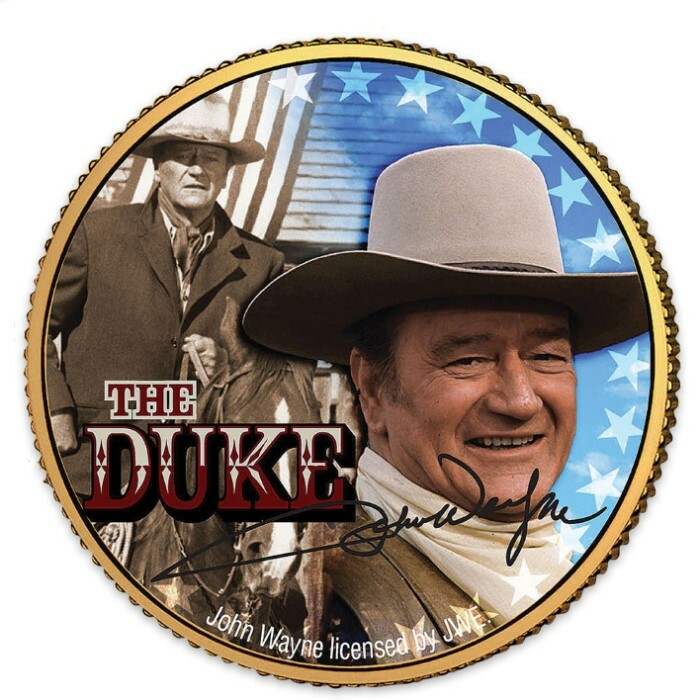 These officially licensed coins are treasured collectible, combining the popularity of American icon John Wayne with the fun, traditional hobby of coin collecting. 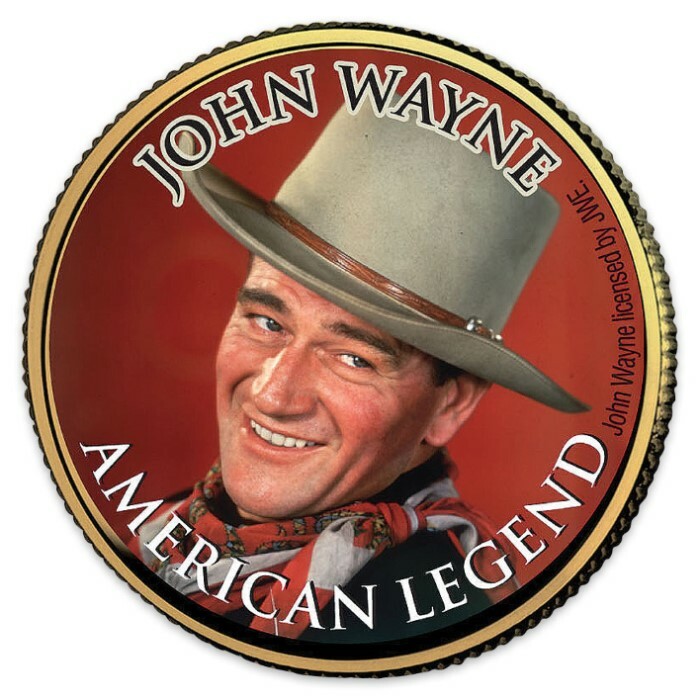 Here is your chance to own one of the few coins elegantly gold-plated and handsomely colorized by the Merrick Mint to showcase the movie legend himself. These high-quality genuine legal tender coins were colorized using a cutting-edge, painstakingly detailed multicolor process. Through this revolutionary technique, the Merrick Mint applies vibrant inks directly to the surface of each coin, achieving a level of detail, color saturation, and durability that is simply unrivaled in the collectible coin industry. Housed in their protective transparent acrylic capsules, these top-quality coins will last multiple lifetimes and are sure to become beloved family heirlooms. A Certificate of Authenticity is included with each set. 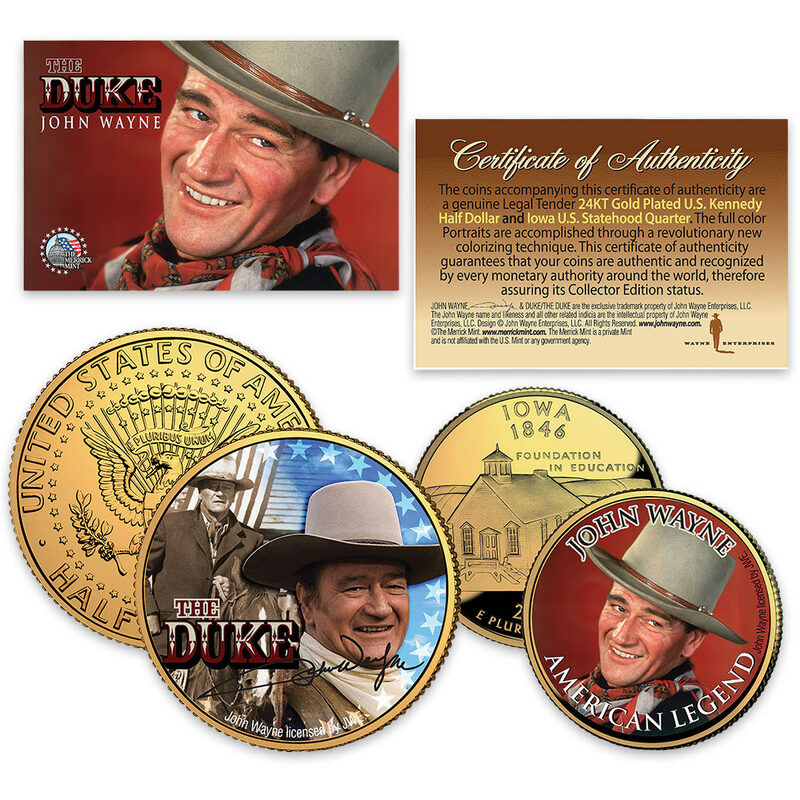 Display the 24K gold-plated John Wayne JFK Half Dollar and Iowa Quarter in any coin, western, classic movie or “Duke” tribute collection. Get several sets to gift to friends and family. It’s easy and painless with our affordable prices - the lowest you’ll find anywhere! As soon as you lay eyes on these beauties you’ll just have to have more! Don’t delay - these gorgeous coins are in limited supply, and we have one of the last stashes you’ll find anywhere!